Most stings or bites from an insect or spider will often cause minor swelling, redness, itching, and pain around the site. Some people are more sensitive and can experience an allergic reaction to stings and bites such as hives, rash, itchy palms and feet, swollen or itchy eyes, swelling of lips or throat, headache, dizziness, nausea/vomiting, fast heart rate, and difficulty breathing.  If you are experiencing an allergic reaction, go to the nearest hospital or doctor right away. More abundant in the warmer months. 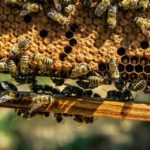 Nests and hives can be found under roofs, in trees, and on equipment like ladders. The female black widow is a black, shiny spider with a red or orange “hour glass” shape on her stomach. The smaller, brown male spider is not poisonous. The black widow spins her web in dark, quiet places – under rocks, debris and woodpiles. 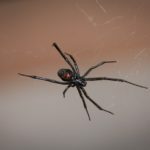 Black widows also like attics, cellars and damp storage areas. The brown recluse is a yellowish-tan to dark brown spider. It is about the size of a quarter. The brown recluse has a dark “violin-shaped” marking on its head. This spider also spins its web in dark, quiet places. 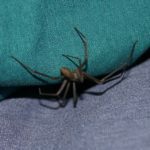 The bite of a brown recluse may be very painful. 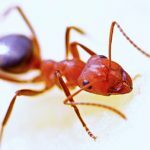 Within 36 hours after being bitten, you may experience restlessness, fever, chills, nausea, weakness and joint pain. A “bulls-eye” like blister or wound may develop at the bite site. If the wound is not treated by a doctor, it may get larger. Bright green with a brown “saddle” mark on the middle of its back. 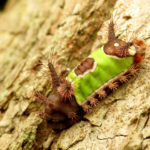 The caterpillar also has “horns” on both ends of its body. If your skin comes in contact with the caterpillar, fine hairs on its body may inject venom (poison) into your skin. The sting can be very painful and the pain will last until the hairs are removed. Remove the fine hairs by gently touching the sting site with a piece of scotch tape. Do not use the same piece of tape twice. If you are stung and feel a burning pain, have swelling, nausea, headache or weakness, go to the nearest hospital or doctor right away. You may be having an allergic reaction. 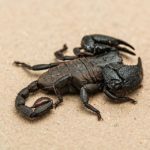 The species of scorpions found in Georgia are not dangerous. Usually active at night and can be found hiding under rocks, wood, or anything else lying on the ground. 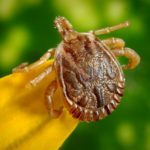 Tick bites are fairly common and harmless, but sometimes they can cause Lyme disease or Rocky Mountain Spotted Fever. Snakes can be found everywhere in the state of Georgia. Snakes are territorial and will attack if they feel threatened. While most snakes in Georgia are nonvenomous, there are 6 that are venomous. The copperhead snake is the most frequent venomous snake bite in Georgia. It is aggressive if provoked. It has an hourglass shaped pattern on its back when viewed from above. It is found all over Georgia. 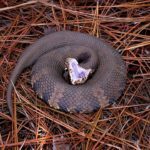 The cottonmouth snake is easily identified by its cotton-white mouth. The snake is territorial and its first warning is showing its mouth before it strikes. These snakes are darker in color and a pattern may not be easily identified. They are commonly found in south and middle Georgia, but have been seen all over Georgia. They tend to be found around wet areas like lakes, rivers and swamps. 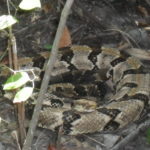 The timber/canebrake rattlesnake is reported to be less aggressive than other snakes but will still attack if provoked or if it feels threatened. This snake is found all over Georgia. 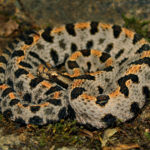 The pygmy rattlesnake is smaller than other venomous snakes in Georgia and can be more easily overlooked. It is grey with black spots which easily camouflages it with gravel, rocks, leaves and even roadways. This snake is found all over Georgia. This is the largest venomous snake species in North America. It can grow up to 6 feet in length and is easily identified by its “diamond” shaped patterns on its back. This snake is very aggressive and can strike its entire body length away from it, so it is important to keep your distance as it is very territorial. 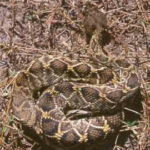 While this snake has been found all over Georgia, this species is most frequently found in south and middle Georgia. The eastern coral snake lacks long fangs and will bite and stay attached as it chews to get venom into the skin. This snake is often confused with the non-venomous Kingsnake because of their similar patterns and colors (red, black and yellow or white). “Red on yellow, kill a fellow. Red on black, venom-lack”. 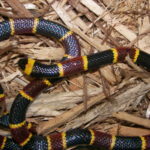 If red bands are touching a yellow band then it is the venomous eastern coral snake. This snake is commonly found in south and coastal Georgia. Do not touch a snake, even if a snake looks dead. A snake can still bite up to one hour after its death.